Today I have the my last Gelicious shade to show you. This one is called Sleep til Noon and it is a simple black creme. I applied two thin coats of Sleep til Noon, curing each under the gelicious lamp for one minute. 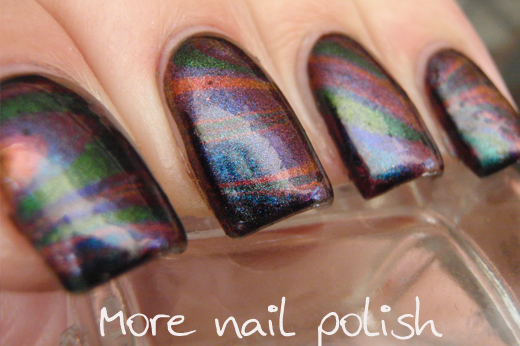 I then applied the ultra glaze top coat and cured for two minutes. I did notice that when I wiped my nail with acetone after finishing the mani to remove the sticky residue, a small amount of black wiped off my nails from the very edges. I'm not sure if this is because my nails have a very strong C curve and therefore the sides didn't cure quite as well. Despite seeing a bit of black on the swab, I didn't notice any difference on my nails, and they still looked perfect. So there you have it, a perfect black creme soak off gel polish - there isn't much more to say about it. When I eventually removed this it came off easily with a 10 minute foil method soak. Now if I just showed you regular black creme in this blogpost, it would be rather boring, right? I mean we all have black creme polishes and we really just consider them essentials in our collections. So what I have for you today is a collection of seven different mani's that all have a black base. With all of these, I just removed the top layer of polish with non acetone remover leaving the black gel base each time. 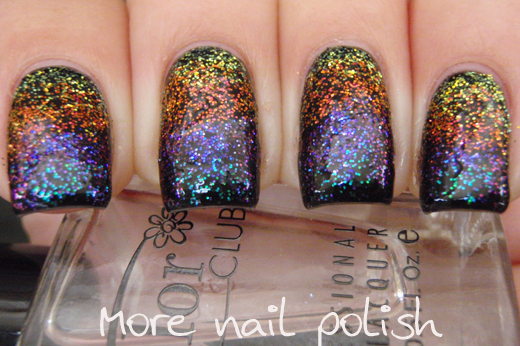 Glitter gradient created with colour changing glitters. 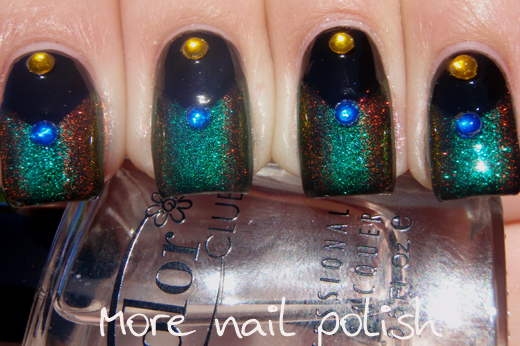 I used Enchanted polishes, but you could also use the Ozotic Elytras or the HIT Phenomenia polishes. 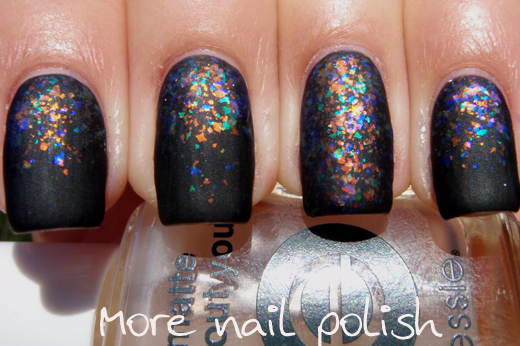 Mattfied flakies gradient. I used Cult Nails Clairvoyant and Essie Matte about you. Floam - I've had this for months and only just got around to wearing it - cool. Holographic stamping - I stamped with Layla Retro Pink. Abstract colour morphing with rhinestones. 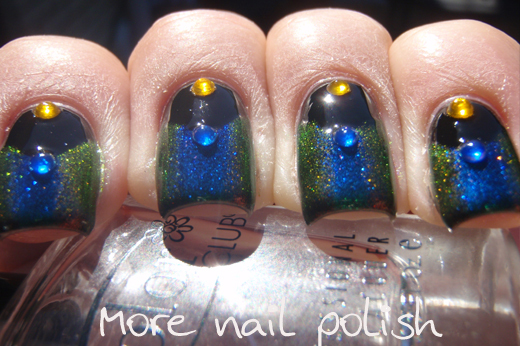 I used gold to green on the outside edges, and green to blue in the center, finished with gold and blue rhinestones. Sugar gradient -I tried creating a gradient with Ozotic Sugar 901, 902 and 903, but I ended up with an awful lot of sugar on my nails. 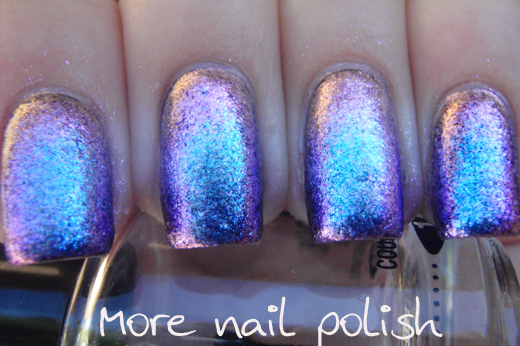 The end result was very reflective and certainly duochrome, but I wish I hadn't put so much on with the sponge. 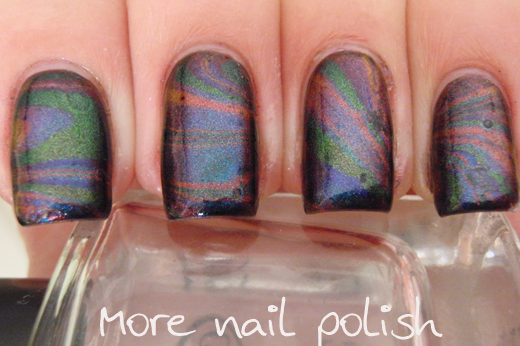 Multichrome watermarble -This is the second time I have tried a multichrome watermarble and I was very proud of me work this time. I used a bunch of Ludurana mulitchromes polishes this time instead of Ozotics, and the Ludurana's work better because they are more opaque than the Ozotics. 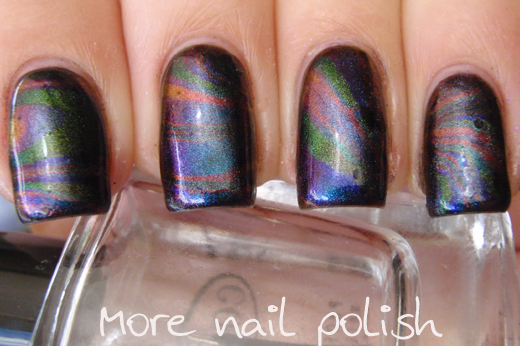 So there you go, a whole weeks worth of different manis all using the same base! Which is your favourite? Try wiping with isoproyl alcohol instead as it's less harsh than acetone. I'm trained to use Gelish and find that the darker colours tend to leave some colour residue when wiping but it doesn't affect the overall effect. Thank you, I will try some isoproyl alcohol. Uma unha mais linda que a outra. Love the stamping! Which plate did you use? 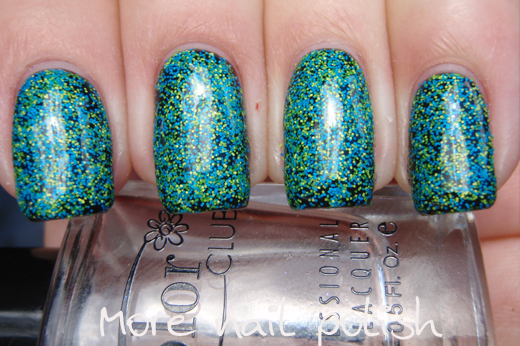 I loved the Glitter Gradient, the Foam, the Layla stamp and the matte flakies...Gorgeous !! Gorgeous! The colour coming off may have something to do with not sealing all of the black between the top and base coat- I use shellac and they say you have to be very meticulous about this, especially around the sides. Ah yes, that could be it. I certainly go close to the edge of the nail with the black, so it probably doesn't get sealed in properly with the top coat. Thanks for the tip. 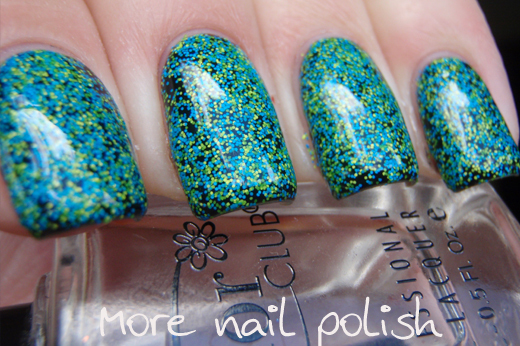 Incredibly beautiful nail polish and you take so nice pictures :) Super good blog! I have always loved the effects of polishes over black. 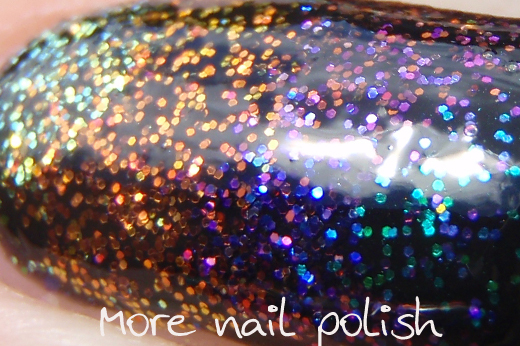 I stopped using regular black polish as it was always hideous with removal leaving dirty looking cuticles etc. Not so with the black Gelicious. I now enjoy all the beauty without the mess when removing as the black lifts off without any colour staining. 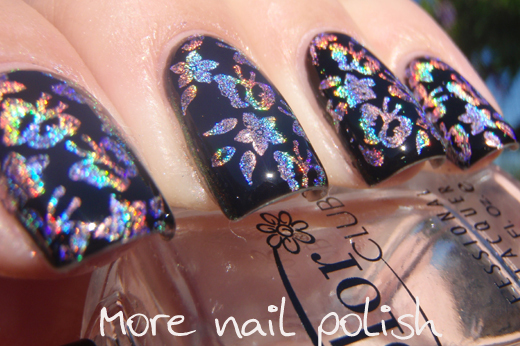 Thanks for all the new ideas - I just love that stamped holographic – it looks like brocade. 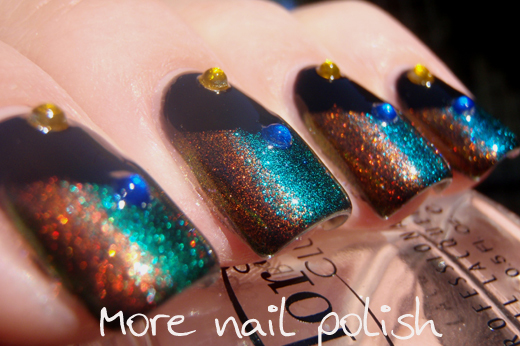 The abstract colour morphing is neat – it’s nice to see different ways of creating some bling. Thanks for all the swatching in fact!!! I know what you mean about regular black being icky to remove. 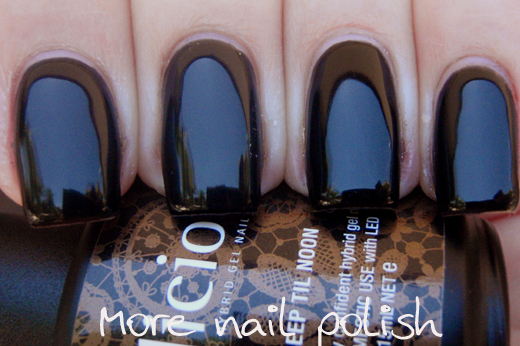 I love that the gelicious black doesn't leave your nails gross and it's so clean to get off. They're all gorgeous! my fave is hands down the butterflies! WOW! 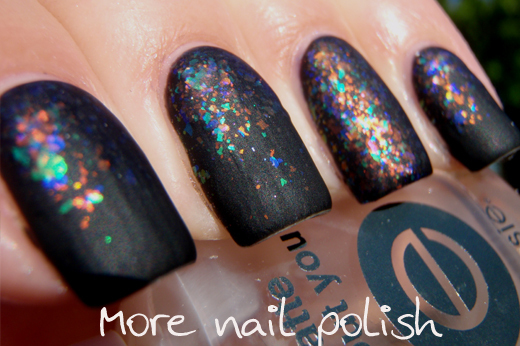 You did some stunning manis! great pics cathy! i have till noon also and have exactly the same problem. i found that i loose a little black onto my clear top coat brush when popping the top coat on and then a little on the pad when i wipe with acetone. also i always cap my tips too but for some reason the black comes off them also when i wipe with acetone at the ned on my mani. 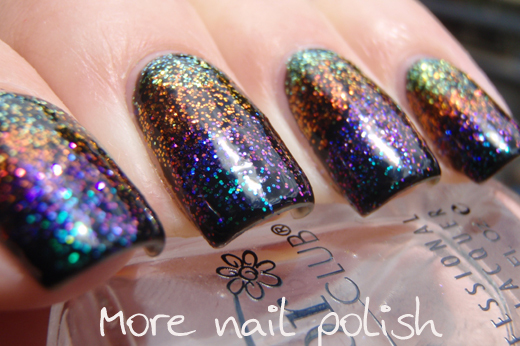 does not with other colours just the black :( gelicilous tried to tell me i was doing it wrong but lets be honest, we are nail fanatics! 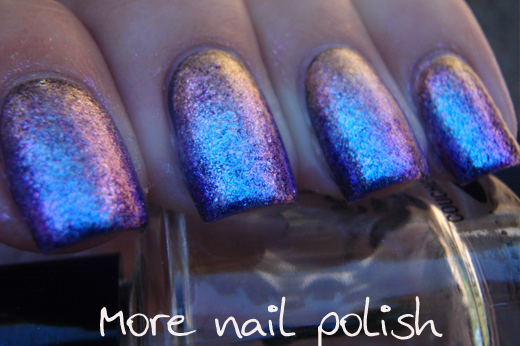 we know how to paint out nails and you are the 5th person to say the same thing about this colour. 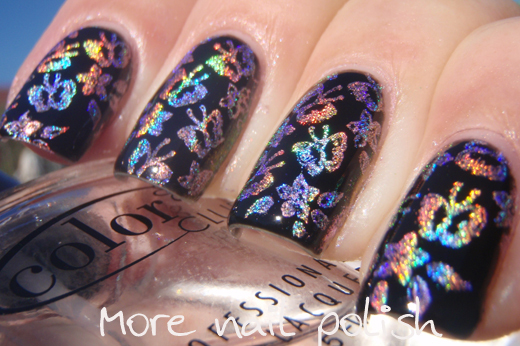 I love the holo stamping! It looks awesome! Oh man ... I've been trying to avoid buying gelicious but I can see I wont be able to put it off much longer! This is divine! 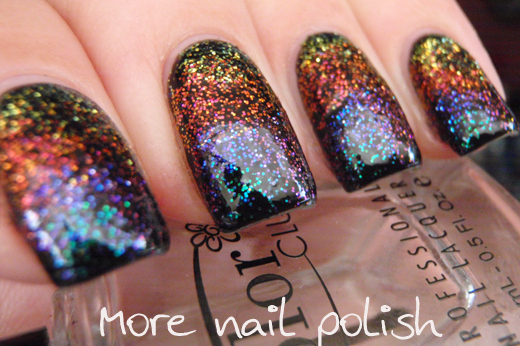 holo stamp... ohhh so purty! !